Not all of your files and settings will transfer from computer to computer. Most of your files and settings are saved on local storage, the hard disk of the machine you're working on. If you set up a custom desktop background, changed the items in your dock, or adjusted other settings, those changes won't transfer from computer to computer: you'll get a blank slate every time you log in to a machine for the first time. And if you save files to the Desktop, Documents, or other folders in the home directory, those files won’t be available if you log in on a different computer. 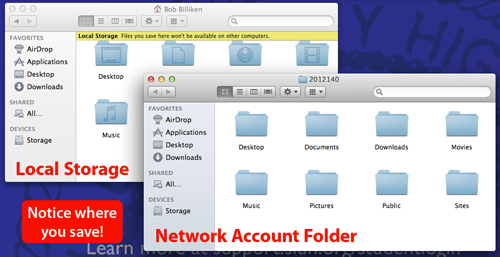 You also have a network account folder, which is available from every SLUH computer. 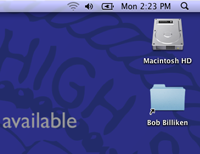 When you log in, a link to your network account folder will appear on the desktop. A banner will appear on local storage folders in some cases to help you tell the two locations apart, but you should double-check that you're in the right place every time you save. You must store any files that you want to keep in your network account folder. This is important! Any files you save to local storage won't be available on any other computer. In addition, if you don't log in to a computer for 30 days, any files you saved on local storage might be deleted to make room for others' files. Store video projects on local storage, because working with these large files is very slow over the network. Just be sure to return to the same computer if you need to work on the project again. Got a personal wireless device? Connect to "SLUH". You can connect any device—iPhones, iPod touches, Android devices, iPads, or laptop computers—to the "SLUH" Wi-Fi network using your network account username and password. You might be prompted to accept SLUH's security certificate, but no other configuration is necessary. Server Names: If you use Connect to Server... in Finder to access your files, connect to student.sluh.org to access your files. PaperCut: To see how much paper you’re using, log in here while you're on campus. Still have questions? Is something broken? Please see Ms. Gruss, Mr. Dickmann in the technology office next to the computer lab.